You made it to college, congratulations! After all the welcome ceremonies, move-in dates, and friendly exchanges, it finally is time to hit the books. 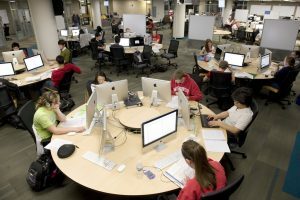 Below are top five studying tips that will get you through freshman year and will help set up studying and learning routines for future years to come. It is better to be well-rested in order to make rational and accurate decisions than be half-awake unable to sort through unorganized, freshly-learned information. Office hours are your time to get help and clarification on information. Make it a habit to go to your TA’s office a few times throughout the semester. They are here to help you, and I promise you’ll feel better about your course and yourself after you go. Make sure to record key points and leave out the extraneous information. If you struggle with deciphering important information from the rest, feel free to audio record lectures, with your professor’s permission, to verify your notes later on. Don’t be afraid to take a ten-minute break every hour or so. Additionally, set aside one day a week where you focus on yourself. In the end, this well help you stay energized and focused. When you are studying, unplug from the internet. Turn off your phone and limit internet access. They are simply distractions that will make it more difficult for you to complete your work efficiently and accurately.